Custom fozzers stag do badges for Zakk Allen. 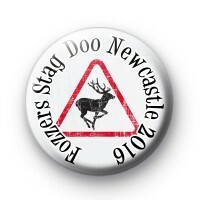 Features a stag in a road sign & the text Fozzers Stag Do Newcastle 2016. Standard 25mm button badge hand made in our UK workshop using metal badge parts with a plastic coated design & copper D-pin back.